Choose what monthly subscription fits you best. And start workout on your terms. For real. To become a member you need to be over 18 years old. In our online shop you can only purchase our regular membership (e-invoicing) and it requires a personal Finnish online bank and a Finnish social security number. You can purchase a fixed term membership only at our gyms during opening hours. To become a member you need to be over 18 years old. In our online shop you can only purchase our regular membership (e-invoicing) and it requires a personal Finnish online bank and a Finnish social security number. You can purchase a fixed term membership only at our gyms during opening hours. Proof of Senior discount needs to be presented. At Fitness24Seven everything counts, even if you don't want to train everyday. Start your journey from BLUE to BLACK membership today. Recruit a friend with a membership for 14,90 €/mo. and get rewarded with 1 month of free training. Bring a friend (one at a time) 5 times a year during staffed hours. Get 10% discount on our training equipment products. Replaces your current membership card and can be collected at the nearest gym. Suddenly working out is even more fun. (Actually we didn’t think it was possible.) 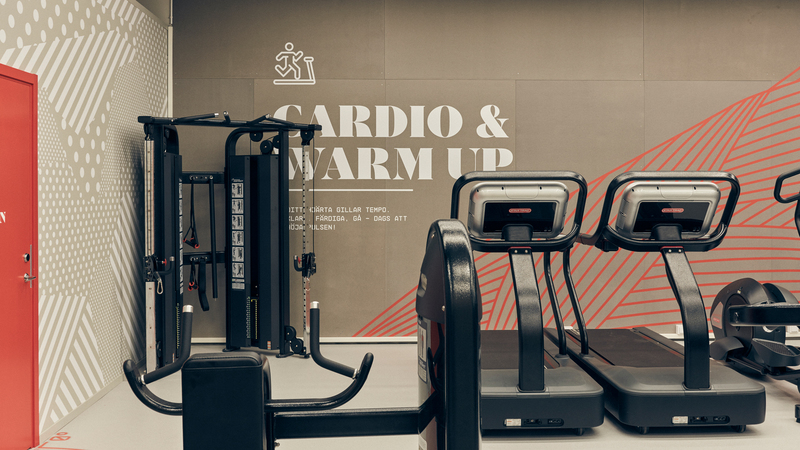 Our new gym concept 2.0 offers a fresh and contemporary interior, carefully thought through navigation and a smarter placement of equipment. Last but not least, we have created a completely new website and app to make your life a little easier. Like it? How do I pay for my monthly subscription? The monthly paid membership is paid by e-invoicing, in a member’s own online bank. The membership fee is paid on the 29th of previous month. Yes! To become a member you have to be at least 18 years old. What is the opening hours? As a member you always have access to the gym, around the clock and all year round. Our gyms are staffed during certain hours on the day and the week. Take a look at the page our gyms to find out when the gym you plan to visit are staffed. Can I do a trial workout? And does it cost anything? If you haven't been a member before you can try our gyms for a week without any cost. Just come by any of our gyms during staffed hours and we'll help you get started. Otherwise we take a fee per session (check the price for your country). How do I renew my membership and does it cost anything? A renewal of your membership can only be done at any of our gyms during staffed hours. If you still have your old card and want to renew your subscription, we will charge an administrative fee of 15 €. If you don’t have your old card, there will be a fee of 9,90 € for that (a total of 24,90 €). Are grouptraining included in my membership? Absolutely! Grouptraining are included no matter what type of subscription you have. Is there any enterprise membership or company deal to take part of? Absolutely! Are you interested in a more holistic approach? We offer lectures, challenges, personal training packages and tailored group training activities. Check it all out here! How can I access a wellness certificate/payment certificate? A wellness certificate/payment certificate can easily be exported by our app for Android or iOS under the section Payment overview. How does your loyalty program work? We do want to give something back to our faithful members. By our loyalty program and the different levels of membership you as a member will be specially obligated by new products, discounts, inspiration from us and our partners. See your current status in our mobile app. Contact our customer service info@f24s.fi if you have any questions about your loyalty status. What is required to achieve GOLD status? To reach GOLD you need to have had an active membership for at least 3 years with a maximum break of 7 days in a row. Do I keep my loyalty status if I have to cancel my subscription for a period of time? If the subscription are terminated for more than 7 days you will lose your status in the loyalty prorgram. It's fine to freeze your subscription without it affecting your status. Do you offer any insurance? Yes, you can sign up for our accident insurance at any of our gyms in Finland, either though you're already a member or you're about to be. It costs 14 SEK/month and the payment day is the business day after the work out subscriptions payment day. You can also pay for a whole year at once and then it costs 149 SEK. Can I freeze my subscription? And how does it work? You can freeze your subscription at any of our gyms during staffed hours. We take a fee (ask for the price on your market) and we could make it last up to maximum 12 months. If you're ill, injured or pregnant we can do the freeze without anyt cost as long as you show a valid certificate. Prepaid memberships (f.ex. half or yearly paid) can't be frozen for a fee. How does Fitness24Seven handle my personal information? If you have a monthly paid membership you can cancel that in our app for Android / iOS or at this link (web). The cancellation period are 2 months from the date you cancel your subscription. Half or full year paid memberships ends by themselves when the prepaid period ends.